Long before a golf club was formed at Dornoch, the game of golf was played on the town lands on the links along the seashore. Sometimes it was frowned on by authority because presumably there was a need for their subjects to practice more warlike activities and good marksmen were needed more than good golfers. “About the toun ther are the fairest and largest linkes of any pairt of Scotland.” To the seafaring, marauding Vikings one thousand years earlier, it was Suderland”the Southern Land. Often these Northmen invaded Suderland, driving the Pictish-Celtic natives inland to the hills; in time they settled, intermarried, and Viking place names Skibo, Skelbo, Embo, Brora, Hehnsdale, Wick, Thurso”remind us today of our mixed Celtic-Viking blood. The northern land, including Caithness, was `the land of Catt’ and it was good Bishop Gilbert, 1222-1245, who organised this land of Catt, with the purposes of the Church in view: the promotion of Christianity, religion and education. Dornoch became a Royal Burgh through a Charter granted by Charles I. In 1877, Old Dornoch was indeed “the sleepy capital” of the most northerly highland county, Sutherland. But changes were in store. One day in 1877, the citizens of the Royal Burgh of Dornoch met together and formed the Dornoch Golf Club. The two gentlemen responsible for the foundation being Mr. Alexander McHardy, ‘the pioneer of golf in the North of Scotland’, and Dr. Hugh Gunn, a native of the town, who was educated at St. Andrews and there learned the game which was destined to bring the sleepy capital of Sutherland so prominently into the world of sport. The course was then only 9 holes long. In 1883 the annual subscription to the club was 2/6 and the annual income was £9.00. In 1886, the Club invited the veteran champion golfer, Old Tom Morris, to visit Dornoch, make a survey of the links and lay out a more fully planned golf course. The basic purpose of these “founding fathers” of Dornoch golf more than one century ago was to have a golf course of first class quality in keeping with the abundant natural resources already provided in the famed Dornoch Links. 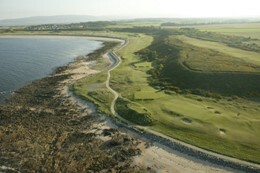 For a score of years following John Sutherland’s appointment as secretary in 1883, his steady purpose and that of the golf club members was to achieve a first class golf course, About the turn of the century the great Sandy Herd first played with the new rubber-cored ball and out of fashion went the old gutty. John Sutherland, the Club’s Secretary who guided the fortunes of the Club for over 50 years, and his committee, had to remodel the course as a result of the faster ball and Dornoch became for a time the 5th longest course in Britain.